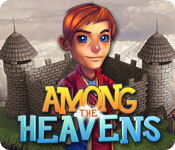 Among the Heavens is rated 3.3 out of 5 by 14. Rated 5 out of 5 by may_be_uk from enjoyable time management game This game really provided a challenge some levels were not able to be completed with 3 stars without using powerups. The game wasn't able to be revisited after completion, and each level is independent of the previous. So power ups are restore after use if you don’t make enough points. Each of the 5 zones each have their own challenges, and the match 3 games providing the power ups give it a change of pace. I would say that the only down side was the number of levels, typically I would expect that a time management game would have about 70-100 levels, including tuition games. This had just less than 50 levels - though it has been left open ended that it might be continued with a follow-on game. Rated 5 out of 5 by megatema from Excellent game! 3d graphics, lots of fun and challenge! Rated 4 out of 5 by Jeana_Lowes from Cute and fun! This is making me wish I'd given 'All My Gods' a 5 star rating... But, this one is really good, too. There are a number of unlock-able rewards and items to purchase with your earnings. I found the controls a bit unresponsive at times, and the number of events happening at once a bit harder to keep up with, but overall control was good and the difficulty was a refreshing challenge. I seek out this style of game and find the virtual reward factor to be quite high in playing them. Rated 4 out of 5 by asiyah586 from Sort of like Diner Dash Great game...reminds you of Diner Dash but not enough to where you cannot enjoy it. Rated 4 out of 5 by camilla_games from Worth one to try This game is a fun marriage of Diner Dash and a match 3 game. Most of the time you play as a waiter/restaurant manager serving clients, assigning them to appropriate seats and purchasing upgrades. During the time in which you're not doing that, you play a minigame of match 3 (various layouts) and try to earn enough points to get single-use powerups for your restaurant. All in all, the game is reasonably priced and worth purchasing. It has quite a few customer types, restaurant upgrades as well as restaurant locations. The game gets very challenging.. very fast.. :) Enjoy! Rated 4 out of 5 by pennmom36 from The Sky's The Limit Cid and Markus have opened up a Potion Tavern on cloud nine, or somewhere in the sky. 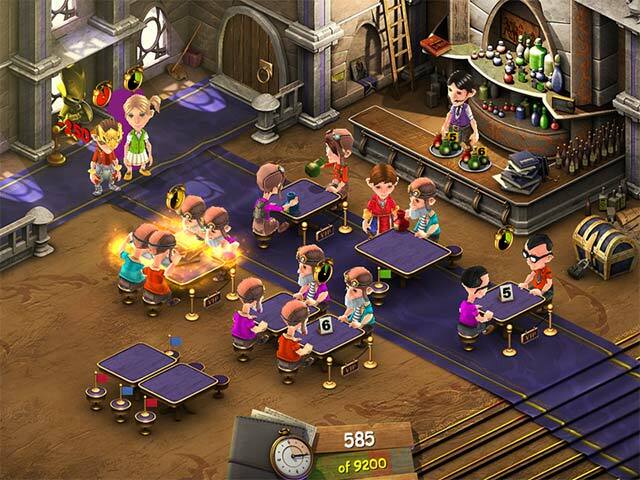 The first tavern is kind of a dump, but with each new level, they open a new tavern that get's progressively more modern. The basics of this Time Management game (available in Casual or Expert modes only) is the same as with most restaurant themed TM games, Click and drag the customers to an available table (matching colors are worth more) wait for them to make a decision from the menu and Click on them to take their order, Click on the menu pile on the bar to place their order with Marcus, Click on the order when it's ready and click again on the correct table to serve the order. When they are finished, you click on the table to collect the gold and a round meter will appear, if you click on the meter when the arrow is in the green zone you will receive a bonus tip, if you click too early or late you get no tip. The final step is to click on the treasure chest which is your cash register. 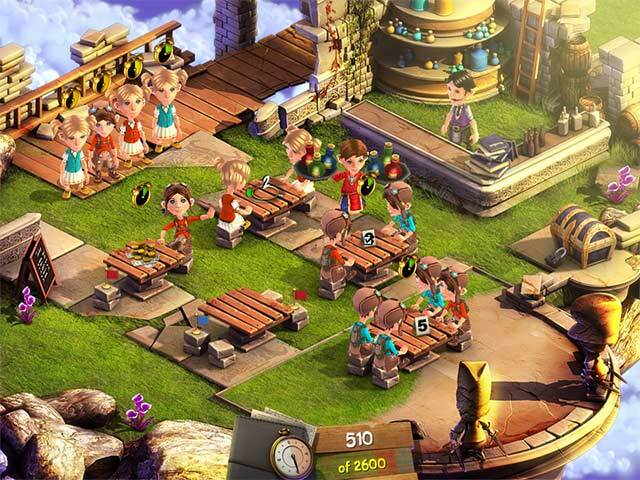 After each level you can visit the Shop to purchase upgrades such as Running Shoes to make Cid move faster/ Upgrading Markus' potion making skills/ Upgrading the Tables to have better timing/ Shorten the Menu's to make ordering faster. 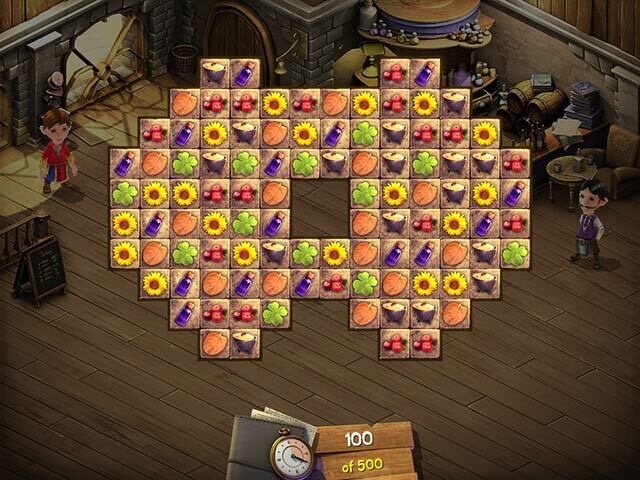 You can also choose to play (or skip) a Match 3 game which will reward you with potions that can be used during any of the levels, the Match 3 game is short, but not appealing or fun, in my opinion. Each type of customer has a different level of Patience, Slowness and Generosity. -Old Man Jefferson: gives twice as many points for any action once served. -Howard: once seated, he will give each young ladies party a bonus. -Elite: when served he gives three times the usual points for each action. -Christie: owns a nearby tavern and will help by speeding up the way customers order drinks. -Klara: will make sure other customers son't lose their patience. -Jim: is a geek, and he will give you a bonus for each Geek party you seat while he's seated. This isn't the best DD type TM game around, but it does have excellent graphics, interesting characters and some unique features, so give it a chance, enjoy! Rated 4 out of 5 by LanaPook from Good game! I played the free hour and liked the game. It gets difficult pretty quickly but not impossible. The characters are cute. The only reason I did not give it 5 stars is that I prefer the building TM games. I may buy this one, don't know yet. Rated 4 out of 5 by pattik63 from Very cute Time Management Game Am so glad when a TM game comes along and this one is similar to a Diner Dash which I love. Has also match three for power ups. It is cute and somewhat challenging but yet not too impossible. Rated 3 out of 5 by GalacticHuman from Not so Heavenly I love magical Time Management games like the Miriel games and so when this came out I bought it straight off. It's got great graphics and the music isn't too annoying, but there were a few things I'm dissapointed with. I haven't finished playing yet, but so far at the 2nd tavern there's really little to write home about. It's annoying that you can't put more than one seperate person at a table if there are empty spaces. This wouldn't be so bad if the new customers didn't back up so much. I also didn't like the way the characters bang on their tables like spoilt kids if they have to wait too long. I'm really quick with these games usually, but this is just a little too crazy. The gramophone doesn't really do much and I didn't get why the old man was there as he didn't make any difference other than using up valuable time when you had to go and talk to him. The power-ups (speed up, stop time) only happen when a Match 3 game comes up which isn't on every level and even then they can only be used once and then that's it. I also noticed that the 'stop time' power-up didn't stop the customers from banging on the tables anyway. I think my most dissapointment has been that you can't decorate/upgrade each place (well thus far), so there's no creative outlet. Overall I think this game had potential as the main character is quite cool, but whereas I look forward to playing Miriel etc, this game has so far left me a little cold.